UPDATE – Robin Givhan decided to examine Callistastyle at the Daily Beast, and it's pretty good, but she doesn't really say anything you haven't already read here. 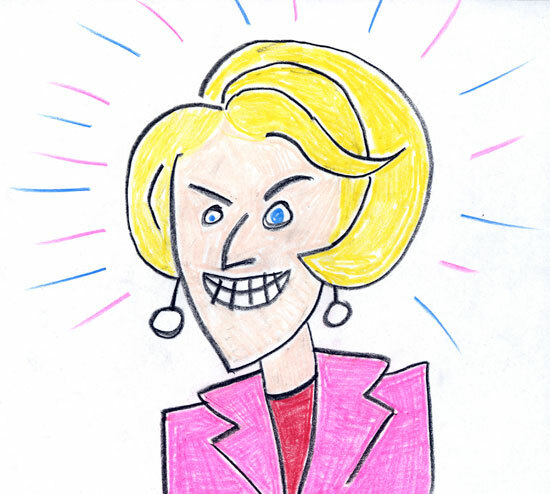 Givhan decides that Callista, whom she compares unfavorably to rival goddess Cindy McCain, appears to be out of touch, old-fashioned, and her appearance requires too much effort. She notes that Goddess Callista dresses older than she is, but doesn't connect the dots to arrive at the explanation I've given here: she does it in part to minimize the obvious age difference between her and Newt. Anyway, for the most part Givhan's observations are spot-on. C'mon, you can make her scarier than that. Pleeeease post a pic of the Martian dressed as a blond bombshell that bites Martin Shorts finger off in the movie 'Mars Attacks'. She is the spitting image of Calista! A lower cut blouse so you can see her necklace. But only minimal cleavage, which is all she has. Good but as Nixiebunny says, not scary enough. Also does she show her teeth? I see her mouth as tight stretched as if she doesn't want to show those tell-tale vampire fangs. okay, okay, everyone's an art critic and really, should we be looking this gift horse in the mouth? Thank you, princess. She is Art. This doesn't work, she looks too animated. She lacks the trademark Callista zoloft-inspired serenity. the hair is good, though. OMG that drawing is Callistariffic. I get the same feeling of strained discomfort that I get looking at the photos. No joke. Do you think that Callista wouldn't be trying so hard to look older if Newt didn't have at least one daughter who is older than she is? (Newt's younger daughter was born the same year as Callista; I'm not sure which of them is older.) It's kind of tacky when your wife looks obviously younger than your daughters. Wonder 'do, check. Eye size differential, check. Recent Dulles pink outfit confection from the "Merry Matron" line, check. Tiffany's earrings, check. Angular bony pointiness, check. Well, you've hit all the highlights, I think. Bravo! Also, I think Robin Givhens is right to point how how much of a throwback Callistastyle is and how much it stands out. I mean, hell, we probably wouldn't have talked about the May 2011 version of Callista. But there's effortlessness, the appearance of effortlessness that takes a lot of effort, and then there's Callista, which not only takes a lot of effort, but doesn't let you forget it, and incidentally also has its own mobile hair command unit*. Givhens doesn't really expand on that, which I think is a little unfair to Callista. In another light, that "appearance of effortlessness" may be seen as a pernicious lie at the source of lots of skewed expectations. On the other hand, Cindy McCain seems more comfortable in her own skin in a way that has nothing to do with her hair, clothes, and makeup. Probably because she earned that though maturity and being Cindy McCain. Callista really can't hold a candle to Supreme Goddess Cindy McCain. Sometimes Cindy is lacquered up like a china doll, buffed to a high sheen, but other times she's really loose and totally pulls off that elusive "mega-rich casual" look. Callista just seems to be overdone all the time. In complete agreement with the Cindy v. Callista comparison. Cindy is trying to look younger and fabulous and succeeds at both. She looks rich because she is rich and has been all her life. Callista is trying to look both older and richer and it's a tune full of false notes. Callista is so heavily shellacked, she looks like a doorstop. I just want to helpfully note that Jill Biden is 20 years older than Callista Gingrich. How many of you knew that? Or would have guessed it if you didn't know it? Oops, sorry Jill Biden is 15 years older. But still. You get what I mean, right? That eye, gad, that eye is perfect. Please someone post a side by side picture of the blond Martian in Mars Attacks with Callista. I swear they must use the same hair stylist. Except the Martian looks slightly less stiff than Callsta.